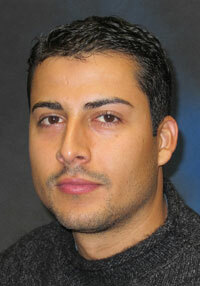 Eduardo Valentin Cruzado has been appointed research technician to assist UNL Dry Bean Breeding Specialist Carlos Urrea at the Panhandle Research and Extension Center at Scottsbluff. Cruzado comes to the Panhandle from Mayaguez, Puerto Rico, where he had been assisting Timothy Porch at the Tropical Agriculture Research Station, operated by USDA. He has also worked at the dry bean program at the University of Puerto Rico with James Beaver. He received a bachelor's degree from the University of Puerto Rico in agronomy and soil with a concentration in crop protection. Urrea said Cruzado will be responsible for all dry bean breeding and garbanzo field work at the Panhandle Center and in growers' fields. He will work with temporary and seasonal laborers on research and testing nurseries and operations, and with graduate students assisting with their projects. His duties also include greenhouse and laboratory activities.